Peter Hilborn, a 2006 member of the Revolution front ensemble, sent this picture. 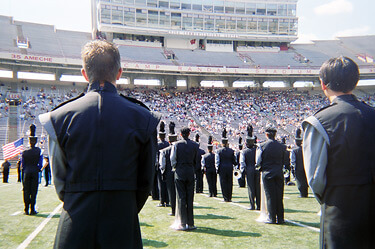 I wanted to share a drum corps member's perspective with this photo. Picture being at a full-corps retreat just after the last time you were ever going to perform and one of the last times the whole corps will be in the same place at one time. You're looking up to the crowd and having a daunting feeling that the summer is over. This experience is why I want to go back and march forever. It's a good thing that there is an age limit in junior corps or I would never find a real job.